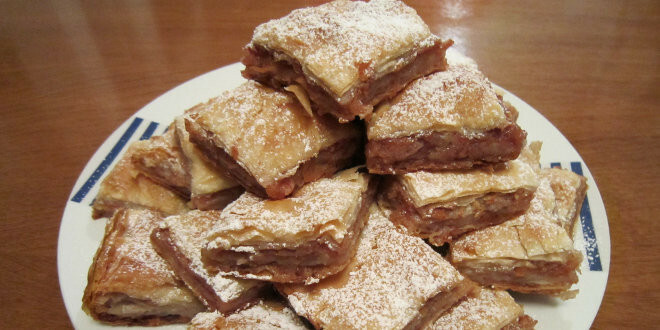 This type of phyllo dough apple pie is often prepared in the Balkan regions. We don't really know where this recipe originated from, but we do know that bakers all over Serbia, Croatia, Bosnia, Macedonia, Bulgaria and Greece use phyllo dough sheets to prepare savory and sweet pies. Here is our version! 1 package of phyllo dough pastry sheets. In a bowl, mix the sugar, apples and the juice from 2 squeezed lemons. Strain the mixture to remove the excess juice. Prepare the baking pan (16″ X 11″ X 2″) by coating it with a thin layer of oil on the bottom and sides. Place the first phyllo pastry sheet into the pan, sprinkle with warm vegetable oil and spread the oil using a spoon. Place the second phyllo pastry sheet and sprinkle with oil. Place the third phyllo pastry sheet and sprinkle with oil. Place the fourth phyllo pastry sheet and sprinkle with oil. Place the fifth phyllo pastry sheet and sprinkle with oil. Note: In case you are using thicker phyllo dough, use only four sheets. Spread 4 tablespoons of bread crumbs, 5 tablespoons of hazelnut and 1/3 of the apple mixture on top of the sheet. Sprinkle a little bit of sugar and 1 tablespoon of cinnamon over the filling. Use three thin sheets (or two thick sheets) of phyllo dough and place them, one at a time (same as in step 5.). Sprinkle each sheet with warm oil before you stack them one by one. Next layer of filling – follow the same procedure described in step 6. 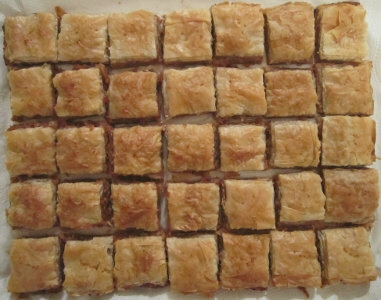 Next layer of phyllo dough sheets – follow the same procedure described in step 7. Final layer of phyllo dough sheets – follow the same procedure described in step 7. Mix a little bit of oil with 1/2 glass of water and a little bit of sugar. Spread this mixture over the top sheet. Cut the assembled apple pie (before baking) into pieces 1.5″ to 2″ in size using a thin and sharp knife. Preheat the oven to 350F (180C) degrees. Bake for 40 to 45 minutes until the top is golden brown. Turn up the heat to 400F (200C) degrees and bake for another five minutes to create a crispy pie surface. You can find phyllo dough pastry in supermarkets or in smaller Serbian, Greek or Turkish shops. Each oven behaves differently – monitor and adjust baking times accordingly. To remove the apple pie from the baking pan, wet a cloth or towel and place the pan on top of it. Let the apple pie cool down for a while and it will be much easier to take out of the baking pan. Sprinkle the apple pie with vanilla powder sugar, if you like. You could also add raisins (pre-soaked in warm water) to the pie filling for a different taste. Always cut the phyllo dough apple pie before baking and only use a thin and sharp knife. 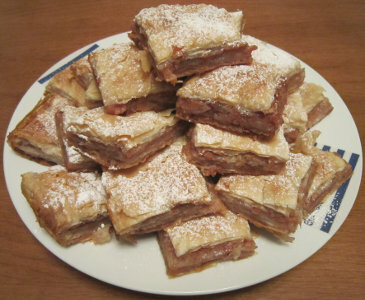 If you liked this “Phyllo Dough Pastry Apple Pie”, and you would like to try another delicious recipe from this region, here is the recipe for the famous gluten-free “Reform Cake“, the undisputed queen of cakes!